Well appointed luxury apartment, suitable for families with children, couples and those who might enjoy the world-class sport and leisure facilities of La Manga Club. Large, light, airy sitting room and dining area opens out onto a spacious terrace with panoramic views of the Mar Menor (sea) and golf courses. This large two bedroom, two bathroom ground floor apartment is centrally (but peacefully) located within walking distance of many of the numerous restaurants and amenities. It is set in delightful gardens with the use of 3 superb pools (one indoor). The luxury apartment benefits from Air conditioning and heating through-out, satellite TV. Broadband Wi-Fi is also available. La Manga Club is a safe, relaxed, 5 star Resort boasting 3 golf courses, an internationally renowned tennis centre and a football academy (e.g. AC Milan junior camps). Voted 'Best Golf Resort in Spain' (Today's Golfer 2012) and 'Best Family Friendly European Resort' (Sunday Times). The Spa is worth a visit too. 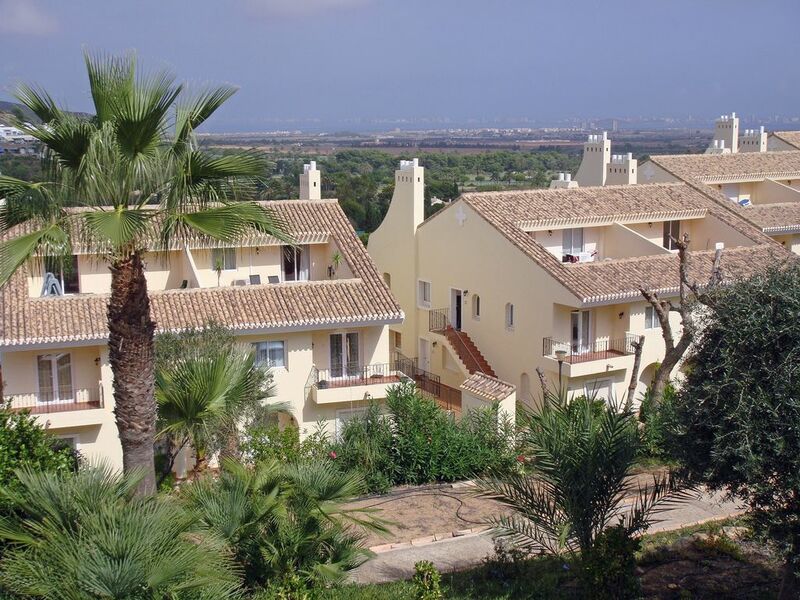 We are a family of four and have been visiting La Manga Club for many years - always renting at Los Olivos, before buying our apartment. We are all keen tennis players and the proximity to the tennis centre was always a major appeal. School and work commitments prevent us from spending as much time as we would like in La Manga. La Manga Club offers many sporting opportunities and experiences for those that wish to partake and yet the environment itself is truly relaxing. La Manga Club enjoys a reputation for being very safe, with a great sunny micro-climate. The property is located in the heart of the resort - opposite the tennis club, 5 mins walk to most restaurants, bars, the hotel, supermarkets etc. The Spa and beach (both 5 mins drive away) are worth a visit. En-suite to master bedroom - bath, separate shower cubicle, his & hers hand wash basins and wc (hair-dryer supplied). Family bathroom - bath with wall mounted shower over, hand wash basin and wc. Includes towels for the pool. Large, light, open plan room opening onto the sunny terrace. Lounge area includes 2 sofas, large flat screen digital TV with additional satellite channels and DVD player. Dining area with table and chairs for 6 people and separate music system. La Manga Club is renowned for top quality tennis facilities. La Manga Club has 3 championship golf courses, all of which are within the resort. The golf clubhouse is less than a 5 mins drive away. There is a small pitch and putt (Par 47) within approx. 100 yards from the apartment. This is suitable for the entire family. 50% off standard fees when staying in this apartment. The resort has hosted many top-level international golf tournaments, including Five Spanish Opens and countless celebrity golf events. Lessons and academies are available. Notes on accommodation: Situated on the upper level within the popular Los Olivos community, enjoying wonderful views. The apartment is centrally located within the resort, but in a very peaceful setting. The internationally renowned tennis centre and many restaurants / bars are less than a 5 minute walk away. The three 18 hole top quality golf courses are also very close by. The telephone in the apartment is available for internal calls within La Manga Club (which are free of charge - this is useful for booking restaurants and tennis/golf). Air conditioned and heated throughout. Broadband Wi-Fi is available - if requested. Cot and highchairs are available by arrangement (at a cost). Outside: Los Olivos boasts 3 swimming pools between its 104 apartments, making it the most popular apartment block in La Manga club. There is 1 very large outdoor pool and 1 smaller one (on the upper level). There is also a large heated indoor pool with jacuzzi and changing rooms for the Winter months. Small childrens' pools are located next to each of the outdoor pools. The apartments are located within mature, well tended gardens. This apartment is situated on the upper level, so enjoys direct views over the tennis club and sea beyond. The apartment is a stones throw from the upper and indoor pools. Cleaning / Towels / Linen / Maid service: All bedlinen and bath towels are included. The apartment will be professionally cleaned prior to your arrival, and after your departure. For 2 week visits a mid-stay clean and linen change is provided. You need to take beach towels. Other: Large outside terrace with built-in BBQ, 2 sun loungers, table and chairs for 6 with cushions. Wonderful views to the Mar Menor. We are delighted that you had a wonderful time, and it is great to see that you are coming back again next year. Kind Regards, Nick & Julie. Our second visit to Los Olivos. Very convenient apartment in every way. We loved the easy access to pools, restaurants and the beach only a short ride away. Next time we may try out of season for a lower temperature. So pleased that you enjoyed our apartment! I agree, off season can be cooler, especially if you want to take advantage of the great sports facilities. La Manga Club is one of the best tennis centres in Europe (several Tour players have trained here). There are 28 courts (20 clay, 4 astro, and 4 hard) and a selection of very high standard coaches. Tennis academies and individual coaching available for both adults and juniors - you must book your tennis well in advance for High Season stays. Discounts apply for Los Olivos 9G. La Manga Club also operate Cricket, Golf and Football Academies - see their website for details. Bikes can be rented within the resort, and the area has several biking trails. Water sports and horse riding can be found nearby. 5 mins drive to the small, local beach within the resort where you will also find La Cala fish restaurant. Other beaches outside the resort are approx. 10-15 mins drive away. The Mar Menor and Mar de Cristal generally offer very safe warm bathing. The nearest airport is San Javier, Murcia (approx 20 mins drive away). This is served by many of the low cost carriers. Alicante airport is just over an hour away. A taxi from Murcia costs approx 40-45 Euros each way. However, a car is useful to explore the area more fully. Cabo de Palos is nearby (10 minutes) and offers a variety of restaurants set by the marina. The nearest city is historic Cartagena (20 mins drive) where you will find the old port, restaurants and excellent shopping. Inland, 45 minutes from La Manga is the beautiful regional capital Murcia. Although a bustling city, there is a beautiful old town with Cathedral, shaded squares, cafes, restaurants etc. Booking Notes: Confirmation of booking requires a 25% non-refundable deposit and the completion of the booking and terms and conditions form. 6 weeks prior to departure the balance of rental must be paid in full. At least one member of the party must be over 25 years of age. Entry to the indoor pool requires a security card, which can be obtained from our Managing Agents locally. Changeover Day: The preferred changeover day is Saturday during the summer months. Short stays can be arranged during off peak times and will be charged nightly. The rental period commences 4:00pm on the day of arrival and terminates at 10:00am on the day of departure.